It can be difficult to leave our little ones, whether we're off to work or running out to take care of some errands. If they're really young, they may not always fully understand why we're going. As a stay at home mom, I've been blessed to enjoy quality time throughout the day with my son. He's super excited, of course, when his father arrives back home from work each day. 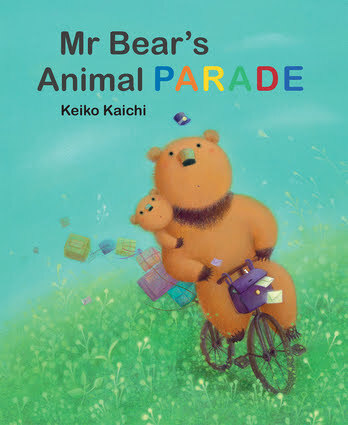 Lately, we've been engaging in a beautiful new picture book by Keiko Kaichi called Mr. Bear's Animal Parade. The theme of this story really resonated with me, since it revolves around a son waiting for his father to return home from work. Little Bear is sad when his father has to leave for work each day to deliver the mail around the forest. Mr. Bear promises he'll return with something special for his cub. But what can a mailman like him bring back? Along the way Mr. Bear finds some old train cars, and —with an increasing amount of company along the way —he hatches an idea that will make this the most special day Little Bear has ever known. Here is a wonderfully joyful picture book, illustrated with adorable art by Keiko Kaichi, that shows how the best of all presents is our presence. This heart-warming story will resonate with young and old alike. Keiko Kaichi was born and grew up in Japan and lives in Osaka. Her work has been chosen annually for the Japanese magazine 'Moe' and in 2009 her work was selected for the Illustrators exhibition at the Bologna Book Fair. She is also the illustrator of The Wolf and the Seven Kids, published by minedition. Mr. Bear (aka Daddy Bear) is a mail carrier who has a lot of packages to deliver. Little Bear understands, but he is still sad that he's unable to spend the day with his father. Mr. Bear promises to bring him back something special at the end of the day to cheer him up. The story follows the father bear as he picks up a set of old crates. He attaches them to his bike as a make-shift train, so he can bring them back home. Afterwards he comes across several bunnies who happen to need a ride. The train soon attracts more company than Mr. Bear had originally anticipated. This gives him an idea to give Little Bear the best surprise ever! I won't go into too much more detail, because I don't want to give the entire plot away. I can add that the story, itself, is magical one– the kind that will really make your little one smile. My son also delighted in the whimsical illustrations and gorgeous water colors throughout. 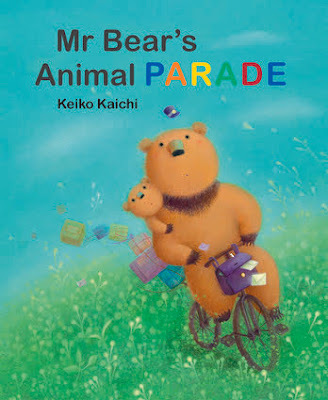 Mr. Bears Animal Parade is an endearing story that would make a wonderful addition to any child's library. There are also a few lessons to be learned in this book. Children will grasp the importance of patience, keeping promises, as well as the joy of togetherness with family and friends.